Mineral Resource Update for Block 1 | Orca Gold Inc.
VANCOUVER, BRITISH COLUMBIA--(Marketwired - Feb. 2, 2017) - Orca Gold Inc. (TSX VENTURE:ORG)("Orca" or the "Company") is pleased to announce an updated Mineral Resource Estimate on the Company's Block 14 Gold Project in the Republic of the Sudan, and provide guidance on the high-grade underground potential at Block 14. Liseiwi Target: Short drill programme confirms high-grade mineralisation with assay results of 10m at 15.32g/t (GSRC596), 8m at 12.8g/t (GSRC599) and 17m at 5.03g/t (GSRC595). Notes: Defined under Canadian National Instrument 43-101 ("NI 43-101"), Standards of Disclosure for Mineral Projects. Numbers may not add up due to rounding. In comparison to the previous estimate (July 2016), Indicated Resources have increased by 10% or 159 koz and Inferred Resources have decreased by 15% or 98koz. The drilling was directed within the PEA design shells and has reduced the Inferred Resources within those shells to less than 3% of total material. Accordingly, the infill programme has successfully confirmed and expanded the PEA resource estimate. The recent infill drill programme at Block 14 has confirmed the potential of high-grade mineralization below the PEA pit designs. Similar potential has also been identified at the Liseiwi target. At Wadi Doum, high-grade mineralisation has been identified in four plunging high grade shoots within or at the edge of the current resource. Significant intercepts include: 25m at 18.4g/t (MET004DD), 27m at 5.47g/t (GSRC615), 30m at 8.06g/t (GSRC542), 30m at 5.83g/t (GSRC690) and 14m at 13.37g/t (GSRC691), occurring at, close to the base of, or at the edge of the PEA design pit. (See Figure 2 in this news release). At Galat Sufar South, high grades were intersected at the footwall of the Main Zone (Main Zone FW) of the deposit where intercepts of 30m at 7.98g/t (GSRC082), 17m at 4.72g/t (GSRC001) and 20m at 7.18g/t (MET007DD) were received. 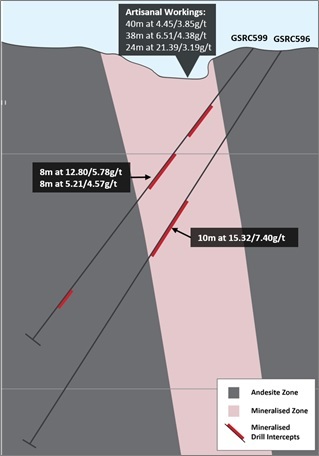 In addition, a high-grade plunging shoot (320 Zone Shoot) was intersected 100m south of the Main Zone footwall returning intercepts of 19m at 13.6g/t (GSRC003), 16m at 17.97g/t (GSRC081) and 7m at 9.67g/t (GSRC183) (See Figure 3 in this news release). In late 2016, the Company completed a short programme of seven reverse circulation holes at the Liseiwi prospect, 15km north of Wadi Doum. 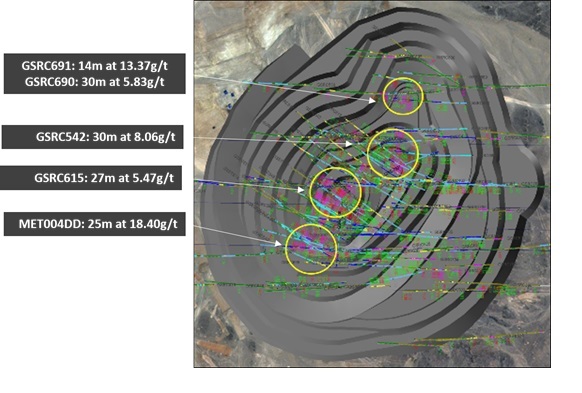 Assay results are highlighted by intersects of 10m at 15.32g/t (GSRC596), 8m at 12.8g/t (GSRC599) and 17m at 5.03g/t (GSRC595). (See Figure 4 in this news release). Exploration in the first half of 2017 will focus on further developing Liseiwi as a high-grade target within the project area, as well as on the underground potential at Wadi Doum and Galat Sufar South, by extending the high-grade mineralization to depth). Commenting on these updates at Block 14, Rick Clark, CEO and Director of Orca, said, "The updated Mineral Resource achieved exactly what was planned with the conversion of most of the Inferred Mineral resources within the PEA design shells into the Indicated category. The new Resource will form the basis of the PFS and declaration of the first Mineral Reserves on the project. The conversion programme also confirmed the potential of high-grade underground options at both the Wadi Doum and Galat Sufar South deposits. 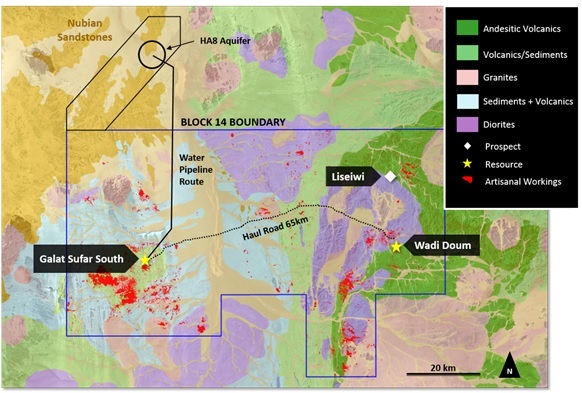 Furthermore, the confirmation of high-grade mineralization at the Liseiwi target, north of Wadi Doum, could represent an expanded development opportunity at Block 14. We look forward to announcing the results of the upcoming drill programmes as they become available." Orca Gold Inc. (TSX VENTURE:ORG) is a Canadian resource company focused on exploration and development opportunities in Africa, where it is currently focused on the development of its 70%-owned Block 14 project in the Republic of the Sudan. The Company has an experienced board of directors and management team and a strong balance sheet, with a treasury in excess of $9.5 million as at December 31, 2016. The technical contents of this release have been approved by Hugh Stuart, BSc, MSc, a Qualified Person pursuant to National Instrument 43-101. Mr. Stuart is the President of the Company and a Chartered Geologist and Fellow of the Geological Society of London. The Mineral Resource estimate was carried out by Nic Johnson of MPR Geological Consultants of Perth, Western Australia who is considered to be independent of Orca Gold Inc. Mr. Johnson is a member in good standing of the Australian Institute of Geoscientists and has sufficient experience which is relevant to the commodity, style of mineralization under consideration and activity which he is undertaking to qualify as a Qualified Person under National Instrument 43‐101. Mr. Johnson consents to the inclusion in this press release of the information, in the form and context in which it appears. Samples used for the results described herein are prepared and analyzed by fire assay using a 50 gram charge at the ALS Chemex facility at Rosia Montana in Romania in compliance with industry standards. Field duplicate samples are taken and blanks and standards are added to every batch submitted. This press release contains forward-looking information and forward-looking statements within the meaning of applicable Canadian securities laws, including statements regarding Orca's (the "Company", the "Corporation", "we" or "our") plans and expectations relating to the Block 14 project ("Block 14") in northern Sudan and the Pre-Feasibility Study ("PFS") currently being conducted by the Corporation. These statements relate to analyses and other information that are based on forecasts of future results, estimates of amounts not yet determinable and assumptions of management. Statements concerning mineral resource estimates may also be deemed to constitute "forward-looking statements" to the extent that they involve estimates of the mineralization that will be encountered if the property is developed. The assumptions, risk and uncertainties outlined below are non-exhaustive. Should one or more of these risks and uncertainties materialize, or should underlying assumptions prove incorrect, actual results, performance or achievements of the Corporation, or industry results, may vary materially from those described in this presentation. 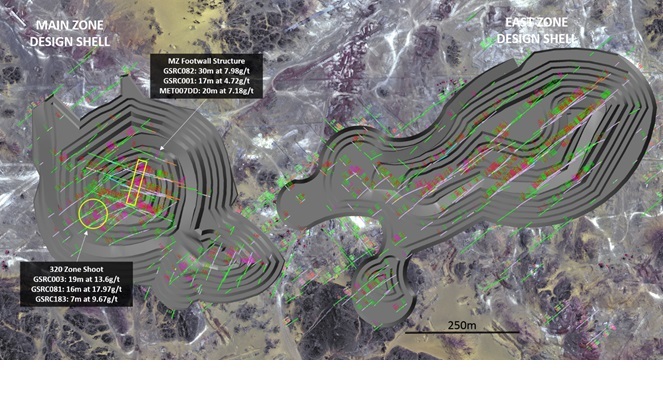 Forward-looking statements and forward-looking information are not guarantees of future performance and are based upon a number of estimates and assumptions of management at the date the statements are made including without limitation, assumptions about the following (the "Forward-Looking Factors"): future prices of gold and other metals; successful exploration, development, and production of Block 14; the timing and completion of the PFS; performance of contractual obligations by counterparties; operating conditions; political stability; obtaining governmental approvals and financing on time; financial projections and budgets; obtaining licenses and permits; government regulation of the Corporation's mining activities; environmental risks and expenses; market conditions; the securities market; price volatility of the Corporation's securities; currency exchange rates; foreign mining tax regimes; insurance and uninsured risks; financial projections and results; competition; availability of sufficient capital, infrastructure, equipment and labour; dependence on key personnel; dependence on outside parties; conflicts of interest; litigation; land title issues; local community issues; estimation of mineral resources; realization of mineral resources; timing and amount of estimated future production; the life of Block 14; reclamation obligations; changes in project parameters as plans continue to be evaluated; and anticipated costs and expenditures and our ability to achieve the Corporation's goals. While we consider these assumptions to be reasonable, the assumptions are inherently subject to significant business, social, economic, political, regulatory, competitive and other risks and uncertainties, contingencies, many of which are based on factors and events that are not within the control of the Corporation and there is no assurance they will prove to be correct.